Who doesn't love a trip to the zoo, it's such a great chance to see all sorts of animals up close and learn more about them. 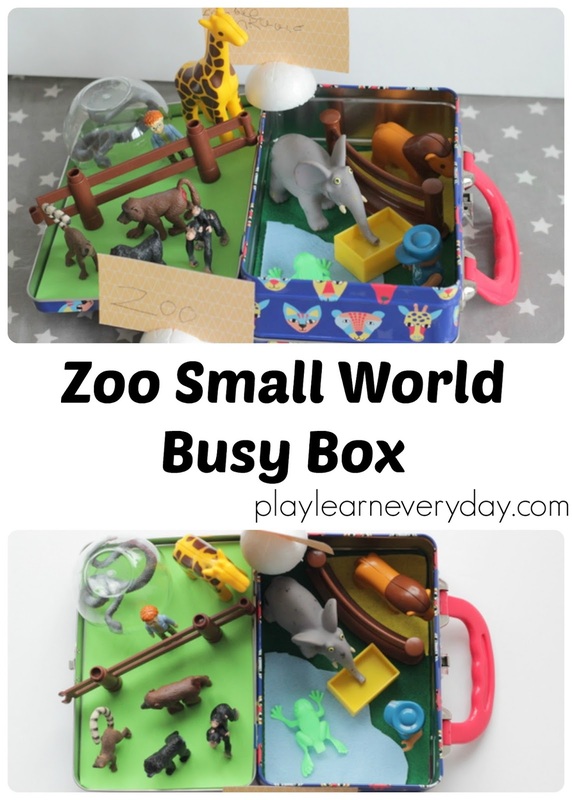 Of course we don't get to the zoo very often, but making our own little zoo small world busy box is the perfect way to use toys that we already have to create a fun little play set that's easy to bring with us wherever we're going! The first step is to line the inside of the metal lunchbox with different materials to create different areas of the zoo. On one side I cut a piece of green foam to fit inside and glued it on. On the other side I used a piece of green felt which I cut to size and stuck on. Next I cut up some more felt to create the different habitats for a variety of animals. So a bit of blue felt is now a water enclosure and some yellow felt can be a sandy surface for desert animals. These bits of felt I haven't glued down, so that they can be moved around. But they stick quite nicely to the other felt so they will stay in place while the kids are playing. Then we found lots of different toy animals that belong in a zoo and placed them all around. We've got a lion in the sand with a little fence separating him from the elephant on the grass who is drinking water, with a zookeeper nearby. Then there's a frog in the pond. On the other side we have an elephant on one side of the fence and a group of monkeys on the other side. We've also got a snake who is in a glass enclosure (upside down plastic yogurt pot) and even a little boy having a look at the monkeys. We decided that this little boy could be the child in the story Dear Zoo (buy from Amazon UK / Amazon US), who writes to the zoo to send him a pet. (We love this book, and how fantastic does this 35th anniversary edition look, such a classic). Finally we made some signs for our zoo, I cut a polystyrene ball in half and made little slits in the top to hold our signs. Then Ethan wrote out the word zoo for our entrance sign and made another sign listing the types of animals with arrows pointing to where they are in the zoo. These easily fit into the polystyrene sign posts and can be moved around. 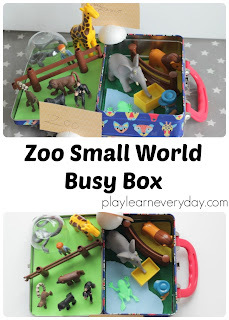 Now our zoo small world busy box is ready to play with, everything fits nicely inside the metal lunchbox and the kids can take it with them when we travel or on days out. 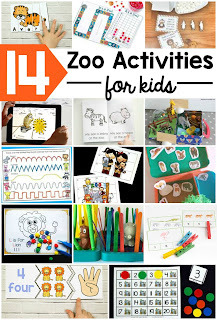 It is so easy to pull out and set up however they like and to make up little stories about a day at the zoo. It's also a great introduction to animal habitats and why they have different types of enclosures at the zoo.